16 June 2016: Antarctic CO2 Hit 400 PPM for First Time in 4 Million Years “The most remote continent on Earth has caught up with its more populated counterparts”. 24 Oct 2016: ‘New era of climate change reality’ as emissions hit symbolic threshold “CO2 in the atmosphere is expected to be above 400 parts per million on average over 2016 and will not dip below that mark for generations, UN says”. Tags: brainwashing, news, propaganda. Bookmark the permalink. So scary milestones don’t move the public. The Pope, Obama and DiCaprio don’t move the public. Movies, plays, comedy, music and crap science don’t move the public. So when are they going to stop listening to the psychologists who scratch their heads and advise more of the same? Either the oil companies have perfected the perfect way to influence the public or there’s something more fundamental going on. If the psychologists can’t see what it is, perhaps they’re not the right people to ask. Oh dear, we’ve passed 400ppm everywhere on Earth now and, supposedly, it’s going to stay that way for generations, so no more Groundhog days, no more milestones, at least until we reach 450ppm, when ‘catastrophic’ warming becomes irreversible. They’re going to be rather bored unless they can come up with some new climate milestones with which to wow the public. Incidentally, I wonder how Scientific American figures that 400ppm is the highest CO2 level experienced in Antarctica for 4 million years when the ice core record (imperfect as that is) only goes back 800,000 years? It went from 220 until 1120 ppm. There is still plenty of room for alarm, even if we pass above 450 ppm. 97% of scientists agree – no more than 350ppm CO2 is crucial in order to maintain a healthy and happy climate. And don’t forget to brush your teeth kids. I find 400 ppm to be very nice. I realize this is only anecdotal evidence, but we seem to be getting huge nectarines, the scenery seems greener than before, and we are having a very nice fall. I noticed there’s more birds in the large tree in the yard, probably because it has much denser foliage. Thus far I can’t see much sea level change. It seems to me the beach sand piles up higher a few mm every year or whatever. And don’t imagine that an ever-increasing proportion of the public are unaware of this ongoing buffoonery, and that so far, despite all the hooting and screeching from the ‘Usual Suspects’ not a single one of the much-vaunted apocalyptic events has in fact come to pass. In fact, some prognostications such as those relating to hurricanes have been diametrically wrong. The desperation on the part of the Warmies is becoming truly hilarious as they realise that nobody evcept a few zealots believes a single thing they say any more. 20 Nov 2015: The concentration of CO2 at Mauna Loa surpassed 400 ppm, was not projected to ever go back below 400 ppm. 19 May 2016: This article refers to the same milestone as the previous article. 28 Sept 2016: The global average concentration of CO2 surpassed 400 ppm, was not projected to ever go back below 400 ppm. 24 Oct 2016: The global average CO2 concentration over the course of the whole year was predicted to be above 400 ppm. Now, you can argue that marking that many different 400 ppm milestones is unnecessarily click-baitey, I’d probably agree with you. 2. are attempting to lie about climate science. I am writing this explanation in the hope that option #1 is the case, and you are a true skeptic. If option #2 is the case, then there’s nothing more we need to say to each other. Brian, thanks for the summary! – except that they don’t, as your list demonstrates. – where did I make that assertion? – I think it’s clear who is attempting to lie here. I suppose that’s true – it looks like you accidentally posted two duplicate articles about the same milestone. Other than those two, the eleven articles you picked describe nine different milestones, describing the escalating concentration of carbon dioxide in the atmosphere. If you read those articles and concluded that the carbon dioxide level in the atmosphere was not actually rising, I’d like to understand how you came to that conclusion. I suppose you didn’t “assert” it exactly, but it’s strongly implied by the large picture of Bill Murray at the top. 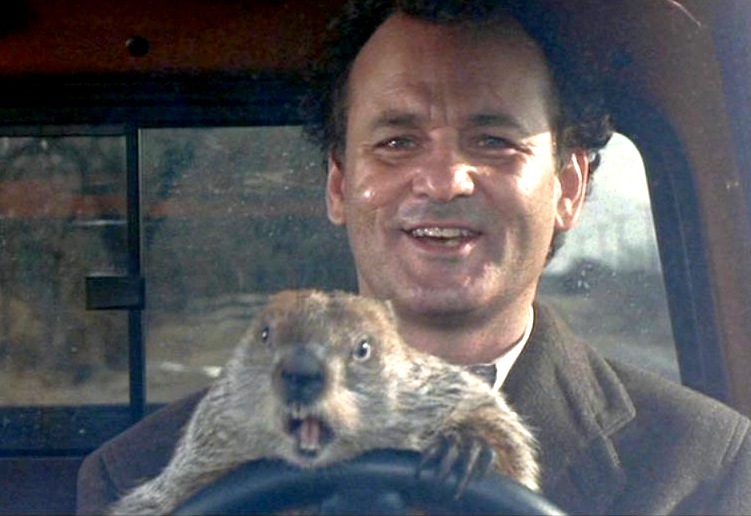 In case you haven’t seen Groundhog Day (you should – it’s a great movie), it involves Bill Murray reliving the exact same day over and over again. I’m finding it hard to understand why that would be the top picture unless you’re implying that scientists have been reporting that we’ve passed the same milestone over and over again for four years. If you’re not trying to imply that, I’m not sure what the point of this post is – I’d appreciate an explanation if you feel like clarifying. This also isn’t quite as clear as you might have hoped. Perhaps you could clarify that too? Compliments to the El Nino of 2014/15/16 and the Blob for providing climate scientists with such a wonderful opportunity to announce so many new and exciting ‘milestones’ over the last few years and to incorrectly attribute them primarily to GHG emissions. There aren’t “two duplicate articles” and I didn’t “accidentally” post anything. What makes you think I concluded that? You seem to be making things up again. I hope it’s now clear even to you who’s attempting to lie. President-elect Donald Trump doesn’t take office until 20/01/2017, and already he is influencing the CAGW brigade in the USA. The U.S. Environmental Protection Agency said it plans to voluntarily withdraw a requirement that seven Texas coal-fired power plants reduce pollution, according to a filing with a federal appeals court. The so-called regional haze rule is part of the Clean Air Act and was proposed two years ago with the goal of cleaning up the air in national parks. The act requires states to craft a plan to address air pollution, or else be forced to implement a plan compiled by the EPA. Texas declined to create a plan, and along with power plant owners took its objections to the EPA’s plan to court. Heh, and he hasn’t even been sworn in yet! How do I know? You of all people should know how I know. That’s what major Ninos do – boost CO2 in the atmosphere. Ergo, the recent run of Groundhog Day-like 400ppm milestones, coincident with the build up of Nino and the appearance of the Pacific warm blob, is extremely likely to have been caused by the additional CO2 expelled into the atmosphere courtesy of these natural events. I know because, even though emissions of CO2 have been climbing, the rate of growth of CO2 in the atmosphere has been generally slowing since the start of the century and the proportion of anthropogenic CO2 in the atmosphere has been declining. So it stands to reason, does it not, that the current breathless crop of 400ppm milestones, are as a direct result of the warming caused by El Nino. Incidentally, the Blob has disappeared, eaten up by an even bigger cold Blob in the Pacific. You seem to be channeling your inner Salby. Really? Do you have a reference? “You seem to be channeling you inner Salby”. My most recent post on this very blog (which you have commented on but seemingly not read very carefully). But your Nature quote does not mean that “the proportion of anthropogenic CO2 in the atmosphere has been declining”, which is Salby-esque. The proportion of anthropogenic CO2 in the atmosphere is increasing. What the Nature article says is that the proportion of each year’s anthropogenic CO2 that remains in the atmosphere at the end of the year has been declining. Purely for convenience, this is measured annually. 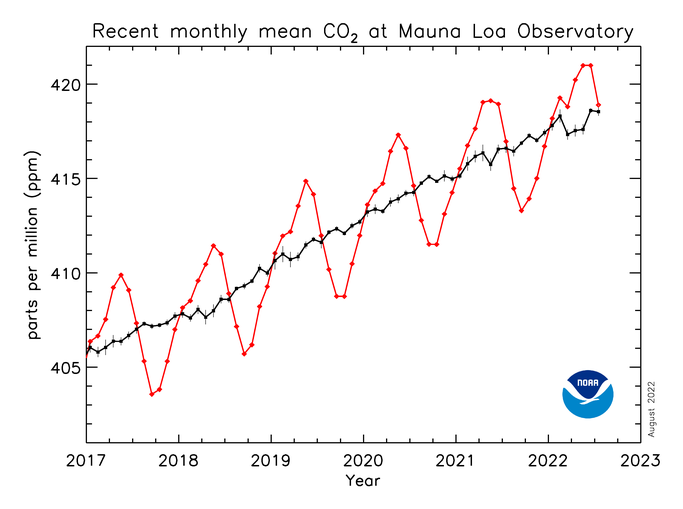 If AF is decreasing but airborne CO2 is increasing overall, this necessarily implies that natural CO2 is increasing in relation to anthropogenic CO2. To take an extreme example, if AF were to shrink to 0% over 5 years, no anthropogenic CO2 would accumulate in the atmosphere from then on and the proportion of anthro CO2 compared to natural CO2 would decline considerably, assuming a steady increase in CO2 ppm. No. There was no appreciable anthropogenic CO2 (aCO2) in the atmosphere in 1880, when CO2 was 280ppm. In 2016 there is 120ppm aCO2 of a total CO2 of 400+ppm. These go up annually by 2-3ppm. Whether that number is 2ppm or 3ppm or 1.9ppm or 2.9ppm matters not a jot; it is going up. In no practical sense is aCO2 decreasing. You’re making no sense whatsoever Nino. I thought you were somewhat smarter than that. This is not a ‘who’s smartest’ contest Nino. If you have a point to make, make it, clearly. All you’ve done so far is wag your finger, saying I’m wrong and that I’m engaging in ‘Salby-esque’ tactics (whatever they are) but providing no cogent explanation of why this is so. One needs little intelligence to understand that anthropogenic CO2 is increasing. Of course, extra atmospheric CO2 also decreases requirement for water. One needs just a little bit more intelligence to discern the difference between a quantity increasing in absolute terms and decreasing in relative terms when compared to another quantity. The little bit more seems to have eluded you. Well look at that, the proportion of anthropogenic CO2 goes up, all you need is arithmetic to see it! So simple arithmetic might not be the final answer I’m afraid. If, after looking at the data, you really think levels exceeded 400ppm because of El Nino, I can’t help you. And if you say that the proportion of aCO2 in the atmosphere is falling because in 2016 the amount of aCO2 absorbed by the ocean fell (i.e. in that year the AF rose, not fell), you misunderstand (what you call ‘outgassing’ is a temporary reduction in how much CO2 the ocean absorbed).